Posted in Above.com, Domain Events, Promotions. Bookmark the permalink. 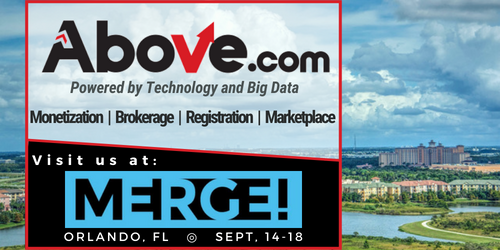 For the second consecutive year, Above.com will be sponsoring and exhibiting at the MERGE Conference. This year’s show will be from Sept. 14-18 in Orlando, Florida. Our team is excited to catch up with old friends and talk with newer attendees about our complete domain management platform. MERGE attracts a wide variety of different backgrounds and our team cannot wait to meet attendees from all digital asset fields. Between our tools and services for Monetization, Brokerage, Registration, and Marketplace, we have something valuable to offer everyone who visits our booth. Co-Founder/CEO David Warmuz has also been asked to speak because of his experience as a successful domain investor for over 20 years. You will not want to miss the knowledge and tips he will share with everyone! This is a great opportunity to get some exclusive insight from David or meet with him personally. This discussion is on Sept. 15 at 3 p.m. If you are planning to attend MERGE next month, make sure to visit our booth or contact us to schedule a meeting! Whether buying, selling, or monetizing domains, Above’s fully integrated platform puts you in control of your data and investment decisions. We deliver the free tools and innovative technology you need to earn the highest return possible on your domain portfolio. Save $200 on registration by entering code “ABOVE” when buying your tickets.